I know I've got a heck of a lot on my wishlist this week but there's so much great new make up at the moment and I want it alllllll! I couldn't even tell you what I want most of all from these things because I am genuinely so excited about all of these products. 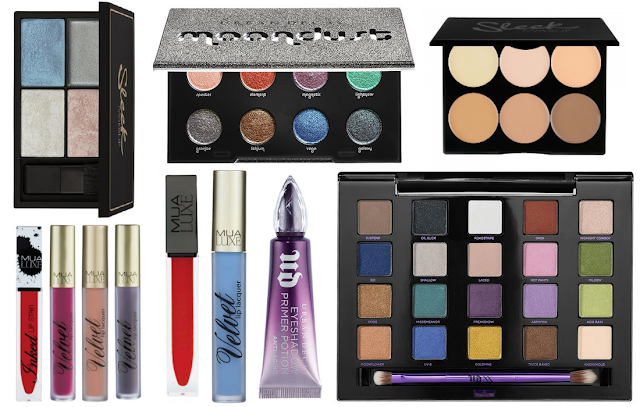 I have only featured 3 brands for this week's wishlist, and they are MUA, Urban Decay and Sleek. They are 3 amazing cruelty-free brands on complete different price brackets but I believe equally as awesome as the next one. Sleek for their amazing face palettes. I mean a limited edition BLUE highlighter. YES. BLUE! Amazing. And I really want to try their cream contouring palette to see if I'm any good at cream contouring! And of course MUA for their gorgeous liquid lipstick collections at the moment. I have a couple of their metallic liquid lipsticks at the moment and I want the rest of them! They're so beautiful and well pigmented and even the Velvet lip lacquers! I have one of them and now I want them all thanks to their gorgeous pigmentation and array of colours... I don't know if I'd wear a blue lipstick, but maybe I could try. Along with blue highlighter and a gorgeous glittery blue eyeshadow look? Tell me if I'm going to far with the blue. That moondust palette looks amazing!! Well I'm certainly wishing for the MUA lip lacquers you mentioned as I want the one I seen on your snapchat so much!